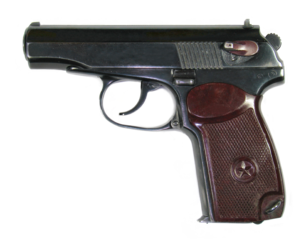 Makarov pistols (Pistolet Makarova) are classic handguns of the Soviet Union, and a pop culture "bad guy" gun. Inspired by the Walther PP type pistols, it gained a reputation for ruggedness and simplicity. The Makarov's 9x18mm cartridge, while somewhat less powerful than a 9x19mm Parabellum cartridge, proves itself to be a dependable cartridge at 20 meters (65 feet) when fired from the Makarov. Being compact, simple, and reliable, the Makarov has seen use in the Soviet Union, its client states, and is still a popular gun with many collectors today. The pistol was introduced to the Soviet military in 1951, one year after it was designed. It was planned to replace the Tokarev TT-33 and Nagant revolvers in service at the time. Being made of 27 parts, it is a very simple gun to maintain and manufacture, but as with any 9mm pistol, it lacks stopping power when compared to a slower moving but heavier pistol caliber (such as the .45 ACP). With eight rounds in the magazine, plus one in the chamber, the magazine capacity is standard for a single stacked, non-staggered magazine. While it is certainly old, it has remained very popular. Even after the fall of the Soviet Union and its formal replacement in 2003, it is still in wide use in the Russian military and police forces as of 2012. 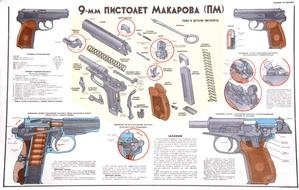 The Makarov was in particular very easily concealed, a big plus for police and security forces in Russia and its former client states. The Makarov has a magazine capacity equal to the Tokarev TT-33, but a slower muzzle velocity of 1017 feet per second (309.98 m/s) compared to the Tokarev's 1460 feet per second (445.01 m/s). The Makarov is also quite lighter than the Tokarev, being 26 ounces compared to around 30 ounces (730 grams vs 854 grams). While all of this data is subject to such things as powder charges and bullet weights, it paints a rough idea of the performance of these cartridges. However, it is a bit weaker than the western 9x19mm Parabellum, as stated above. The 90 grain (5.83 grams) projectile is quite a bit lighter than the standard 108 to 128 grain (7 to 8.3 gram range). Therefore, the Makarov, on average, is a bit less powerful compared to its western counterparts. All of this data however can be misleading, as is evident by the pistols service life. One reason for the pistol's lengthy service life was how cheap and easy it was to manufacture, as well as its enhanced safety compared to the Tokarev (the Makarov also had a heel magazine release, which was trickier to engage by mistake compared to a button release). Another reason the pistol stayed in service is the cartridge. The 9x18mm cartridge, though less powerful, is lighter than its western counterpart, meaning more spare ammunition can be carried. 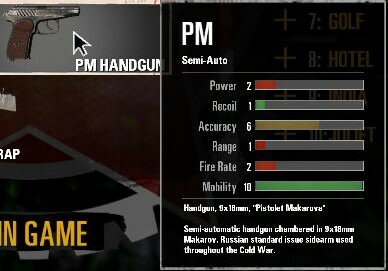 In the game Rising Storm 2, the Makarov feels almost identical to the Tokarev, both have the same recoil and fire rate, but they differ in damage (by one point in the stats menu). This one point difference in damage is unnoticeable, however, and both pistols take only two to three shots to kill. No matter your opinion on these two pistols, they are fine examples of Soviet engineering. While neither seems to be better than the other, they both prove to be excellent weapons. When you get the chance, take both of them for testing, whether in combat or just a fun day on the range, neither will fail you. Miller, David (2001). The Illustrated Directory of 20th Century Guns. Salamander Books Ltd. ISBN 1-84065-245-4. Nice read, PFC. Good job. Short, informative, and relevant to the game. Very well done. Now I know why the Makarov has no advantage stats wise compared to the TT-33. Thanks for an excellent read. I will always use the TT-33, it inspires the commissar in me to come out.